LiveSerials is dead ... long live UKSGLive! Following feedback from our members and delegates at our conference, we're increasingly trying to move away from the 'serials' label to help people recognise the wider scope of UKSG's membership and activities. With the retitling this year of our journal, it seems like a fitting time to rename the blog, too. Apologies for the inconvenience. The new blog's template is a bit more up to date and should hopefully offer all the subscription options you need, including email. Do leave comments there if you have any suggestions about other widgets or whatever that we could usefully add. Please also note that, with the #uksg hashtag on Twitter now effectively overrun by sporty schoolchildren swearing gleefully about their involvement in the UK School Games, we'll be trying to shift our Twitter 'team' over to using #uksglive. With our growing number of speakers, it has been increasingly hard to get everyone's permission to post slides / videos, but you'll be pleased to hear we plan to work harder next year at getting permissions in advance. We'll also plan to load all slides to Slideshare, *during* the conference, and hopefully get videos edited and loaded on River Valley TV within about a week. I would like to publicly thank (a) our sponsor, River Valley TV, for recording, editing and hosting videos of our plenary speakers, and (b) our ace team of bloggers for all their efforts in reporting on the conference. The stats show that we continue to be pretty well read BUT we continue to think about ways to improve / change. Given the growing usage of Twitter at the conference, and the renaming of our 'parent' journal (from which LiveSerials took its oh-so-witty name), we are considering whether we need to revise, rename, retain or retire this blog. *Please* let us know what you think (would anyone miss us? ), either in the comments here, by tweeting @uksg, or by good old email. 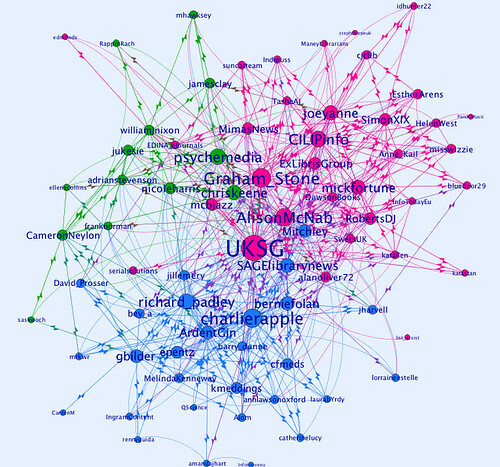 OU lecturer and UKSG speaker Tony Hirst (@psychemedia) put together a nice graphic during this year's conference, to show who was using the #uksg hashtag on Twitter. Check it out below (click on the image to see it in more detail, or see some of his other UKSG visualisations on his Flickr account). Vic Lyte and Sophia Jones from Mimas, The University of Manchester, presented on The UK Institutional Repository Search (IRS), which is a Mimas project commissioned by JISC in partnership with UKOLN and SHERPA. The project was completed in July 2009 and the service has been running continuously since then. Content stored in institutional and academic repositories is growing and they recognise that there are limited ways to access this information. This project has taken cross-search and aggregation to the next level, creating a visionary platform that pulls together disparate content, making it easier to search and discover in ways that meet personal or contextual needs. They demonstrated how the search works including an impressive 3D visulisation option. They gave an overview of the JISC Historic Books and JISC Journal Archives products. They also talked about the JISC Collections e-platform enabling cross-agregated search of a unique resource from the British Library. Content (300,000 books) previously inaccessible will be searchable on the platform. Features include three types of search (exact; detailed and serendipitous) and tabbed filters; Google-style listings and search clouds. It all looked very impressive. Driving usage - what are publishers and librarians doing to evaluate and promote usage? Sarah Pearson from the University of Birmingham kicked off this breakout session and outlined her experience of collection development analysis at her institution. She went on to explain that while they have been doing this for some time, usage alone doesn't tell the whole story. They have been looking increasingly at how users get access to content and what path they take. Sarah highlighted the numerous ways they promote usage at her university. These include news feeds about new acquisitions and trials; making content available in resource discovery interfaces; activating in link resolvers (SFX); integrating with Google Scholar/A&I services; making authentication as seamless as possible and embedding in apps on other sites. There is a Mylibrary tab on the institutions' portal page and a library news section, which are widely used. Users can search the library catalogue direct from the portal page of the university rather than go to the library pages. They are also about to user Super Search on Primo Central, which will be embedded in the virtual learning environment and Facebook. To analyse usage they use a number of services including in-house templates that compare and contrast big deal usage with subscription analysis; JUSP (Jisc) and SCONUL Returns. They look at JR1 reports and evaluate cost per use. They pay particular attention to those resources with low or zero use. They also look at DB1 searches & sessions and compare archive with frontfile usage. With budgets under threat librarians are looking at cancelling poorly performing content and big deals, for example, have to demonstrate overall good value. The University of Birmingham approach, Sarah explained, is to activate online access content everywhere and let the user decide. Google Analytics is being used to look at user behaviour now and to help understand more about their journey to access content. They know that the Institution's portal page is the number one access point but the OPAC and Google are still high referrer sites. There is a low number for access via mobile devices but they expect that to increase. Evaluating usage is still very manual and it is labour intensive to measure the ROI of resources. It is important with increased pressure on budgets to ensure librarians are making the right decisions about which content to subscribe to and purchase. Evaluating usage is an important step in doing this. Christian Box from IOP Publishing followed on with an interesting presentation about the work they are currently doing at the Institute of Physics. By sharing data between publishers and librarians, he said, we can make the industry more efficient. I was particularly interested to hear more about the video abstracts they launched in February this year. Authors can now submit video abstracts and so far they have had over 10,000 video views. The human factor is important in engaging with students and researchers and helps to humanise the journal by conveying the inspiration and enthusiam of the author or editor. Publishers can learn a lot from evaluating the data they have such as seeing which research areas are growing. Web analytics; train of thought analysis; traffic dashboards including social media indexes and extended metrics such as A&I services are all important. Platform development and ensuring connectedness is key. SEO is still vitally important here. Social Networking/Media activity and how it impacts on usage is difficult to track. Physics World has 8,510 follows on Twitter. Local language sites (Japan; Latin America and China) have moderate but growing traffic so far. Access via mobile devices including iphones and ipads is growing and publishers need to operate in this space to ensure users can access content wherever they are. Challenges for publishers and librarians alike include creating new and meaningful metrics to cope with the rate of industry change; niche areas of resarch and primtive metrics. As Christian stated at the beginning of his presentation, it is important for librarians and publishers to work together as much as possible and share data to increase efficiency wherever possible. LiveSerials is operated by the UKSG, a non-profit organisation that connects the information community. It provides realtime coverage of news from the information industry, including reports from the UKSG's Annual Conferences held each April. Want to be alerted when this blog is updated? Click here to find out how to set up a reader to retrieve updates by RSS.